Would like to ask if anyone has experience comparing the quality of a traditionally done 35mm motion picture timelapse with the timelapse you can now do with many DSLR cameras. The stuff I have seen online that was done with DSLR cameras looks a bit jumpy, flickery, and not as polished. Anyone with experience with both who would like to share, I'd really appreciate it. I've been wondering about this myself, Tim. On one hand the DSLRs will most likely produce a cleaner image than 35mm which may look nicer on HDTVs, however, they will lack the dynamic range of film, something that can be important when light drastically changes throughout the timelapse. Also (realistically)add jpeg compression to the mix (since shooting RAW will add space and processing time) and you have further image degradation on the DSLR end. So I'm not sure if there's a definitive answer on this. The reason why the DSLR timelapse looks jumpy/flickery is because the person probably forgot to drag the shutter. Shooting at shutter speeds faster than 1/2 second will cause this stuttering motion when played back. Of course, you can always shoot with a larger format than 35mm 4-perf, like 8-perf. or even 65mm 5- or 15-perf. Comparing a DSLR to a movie camera is a totally unfair comparison. The advantage of time-lapses is that they are very affordable when it comes to film stock consumption! What do you mean by "drag the shutter"? DSLR's will likely be set up to take near instantaneous exposures compared to the actual frame rate - in effect an ultra short shutter angle - in comparison a 35mm could be set up with a very slow motor and a heavy amount of ND to keep that smoother 180deg shutter angle effect. No you can definitely do that on a dSLR without any problems. I can't really think of any significant reason for any quality differences between formats other than the skill of the person doing it. I was talking with a Gaffer who has shot with most of the major Digital formats, D21/F35, Red etc. As he points out none have the magic of film. Stephen , couldnt agree with the gaffer more !! Even more so that we have this great range of Fuji Eterna stocks !! bye ,bye Kodak !! I would prefer film solely because of the dynamic range. Very often scenic timelapses are "made" by those moments where the clouds clear or are clearing and you have patches of full sun and patches of shade. The dynamic range also renders the ever-present sunset/sunrise timelapses much nicer, IMO. I have seen a lot of really nice DSLR timelapses but I think for scenics, image compromises are made by using a DSLR. The gain, as I see it, by using a DSLR is in portability. One person or a small crew can get to places with a DSLR rig that the same person or small crew couldn't do with a 35mm package. It was a very simple way of summing it up! Shooting 5217 all week :angry: the client gets it 50% discount. One person or a small crew can get to places with a DSLR rig that the same person or small crew couldn't do with a 35mm package. Yet again, one needn't use a large 35mm MoPic cam. for a timelapse. It seems to me like an apples and oranges difference. I certainly don't see the need for anything larger than a 400-foot mag. even if you do opt for a big camera. As for the "magic of film" I think that is as bad as saying "film is always better." There are many situations where it isn't. I think the big advantage of digital is that you can review the results instantly. I don't think I've ever been on a timelapse shoot where there was a video-tap that could display what we'd shot. Do these even exist? That seems to be the same reason a lot of ultra-slo-motion shots are being done digitally, even for theatrical production. I don't think I've ever been on a timelapse shoot where there was a video-tap that could display what we'd shot. Do these even exist? Care to elaborate on the 'many' situations where digital is better, can't think of any myself offhand. Sure you can have a video tap with time lapse, but why would you bother? You need loads of power & extra kit to carry around. A home made cardboard range finder will show you what is in frame at any time. I can think of one: portability. One person can carry a DSLR package with filters and sticks on their back with comfort and get to places that would be more difficult for a 35mm camera w/ support and operator to reach. As for having a tap, there are situations where you can get camera shake, lens fog, flare, things of that nature where you can't easily tell if it is an issue without some sort of method of seeing on-site if there is an issue or not. I've heard horror stories (though thankfully have never had time-lapse issues myself) about trucks over a bridge (where the camera is perched) at night, and having to manually black out the lens until the bridge stops shaking and hoping the change in density on that frame isn't noticeable. Compared to which particular 35mm camera? I think of a '50s Mitchell with a 1000' mag. and you win hands-down. An eyemo like Rob's or a modified stills camera with a registration pin., or even a MOS Vistavision camera with a 400' mag should be just as light, although physically larger due to film magazines. Most DSLRs are very heavy for their small size. Plus, you have to carry along a laptop, usually, for data backup. Right, but you know right away that you have missed it, and can, potentially, get another usable shot without having to get the dailies back from the lab and trek out to the same spot again with the right weather conditions. Are we really arguing about the merits of a video tap versus shooting "blind"? I think the merits of taps were obvious 30 years ago. If I were in a situation where the budget allowed for a tap, I would go with one every time, even if it meant I had to hike it up a mountain myself. Well yeah, I agree, but I wasn't really addressing that. My post was only meant to address Tim's original question, and Chris's post right above mine. I'm not usually the one championing DSLRs on this forum but show me one timelapse-capable 35mm camera that will fit, with lenses, filters, media, and sticks in a backpack that one person can carry comfortably all day. I'm not saying it doesn't exist but I don't know of one. Have you guys seen an Eyemo? it is tiny and the WW2 guys carried them around through the whole war it is about the same size as a Bolex. My camera is on a quickset elevator Jr tripod and has a nikon mount. I am currently shooting a 3 month construction timelapse with the Eyemo and Nikon D-Slr guess which one is easier to setup, lighter overall and makes the best picture? Hint it was made in Chicago. Hi Rob. It's been almost a year since I was down there. Do you have this camera locked down on one shot for three months? No I am moving it around day to day... doing 30sec and 1 min run time shots. The original post sat for over a week with no responses, then POW!! Since I originally posted this, I also asked the folks on CML, and talked with Mr. Timelapse himself. 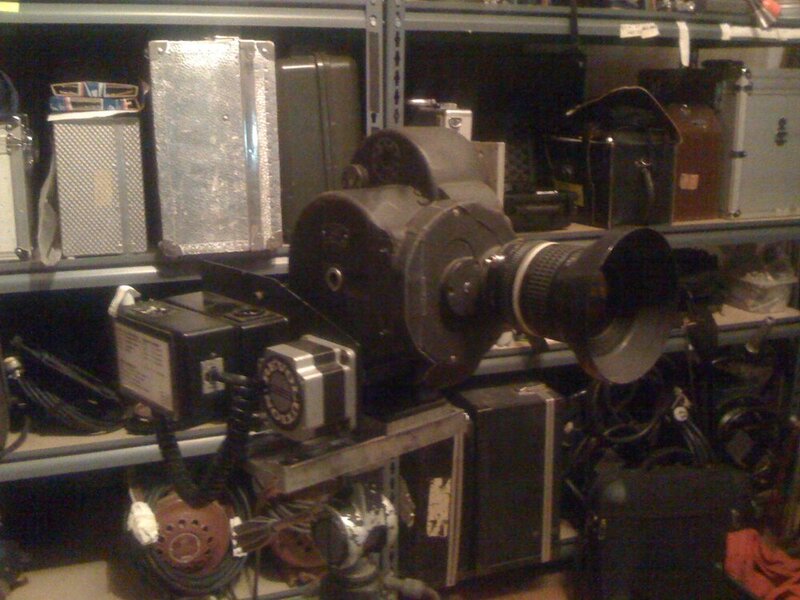 Decided to pursue the Arriflex 35IIC solution. My set up is not as compact as a DSLR, but it is certainly a one man set up. The only real issue is the tripod, which is a heavy duty cine tripod, so I am looking for something a bit lighter weight. But my camera, loaded 200' mag, CE crystal base, CE intervalometer, lightweight rods, mattebox, filters and cables fit into my old PortaBrace shoulder bag, I carry my small Pelican case with my Cooke Speed Panchros and PL mount adapter, and I wear my Bescor battery belt around my waste. Right now I carry the tripod, but I need to find one a bit smaller and more collapsible. But it's not that bad, and much of what I am planning on shooting timelapse, I can access pretty closely by car. The only real issue is the tripod, which is a heavy duty cine tripod, so I am looking for something a bit lighter weight. How much does the whole setup weigh? Maybe someone can suggest a good tripod - I hear the Miller Solo legs with the Arrow55 head is a good balance of weight and performance. Anyway, it can't be much worse than the 8x10 camera Ansel Adams used to lug around, and look at the images he was able to get!